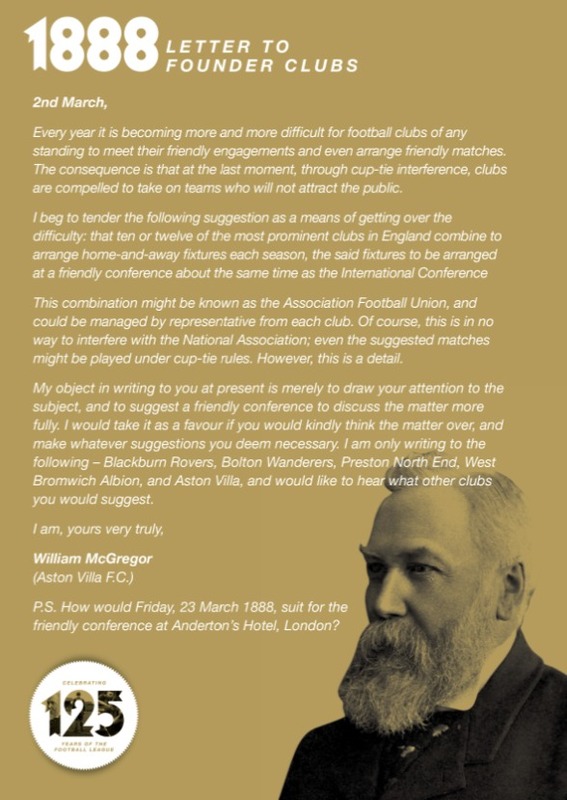 It was 125 years ago on Saturday, or 2 March 1888, that William McGregor, then the president of Aston Villa, wrote a letter to a small group of other football clubs, floating the idea that they should organise a league. In doing so, he changed the world, or at least the large parts of the world that know football as the only truly global game. Football had become a messy and uncertain business, popular with the masses especially as the half-day holiday each Saturday took hold, but structurally uncertain and based around cups and friendlies. The clubs met three weeks later, on the eve of the FA Cup final, at the Anderton Hotel on Fleet Street in London to discuss the idea. A further meeting in April at the Royal Hotel in Manchester agreed upon a name for the competition – ‘The Football League”. The 12 founder members of The Football League were Accrington, Aston Villa, Blackburn Rovers, Bolton Wanderers, Burnley, Derby County, Everton, Notts County, Preston North End, Stoke, West Bromwich Albion, and Wolverhampton Wanderers. The inaugural season kicked off on Saturday 8 September, 1888. “The fact that 125 years later The Football League continues to thrive and that league football has become a sporting phenomenon across the globe is the greatest possible tribute to McGregor’s foresight,” says the League’s spokesman John Nagle. 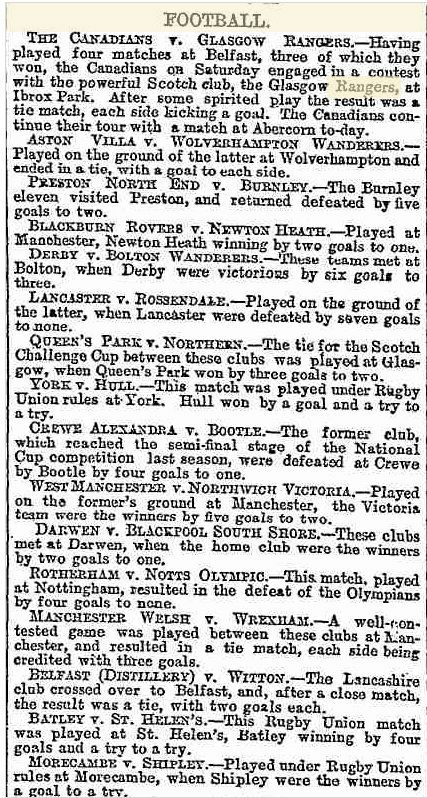 It wasn’t until 21 November 1888 that the League even decided to award two points for a win and one for a draw. So there were no early league tables. There was also no separation in reporting of games between association football and rugby football. Here is how The Times of London reported the action from the opening weekend of the league, on Monday 10 September. Note the reports of those first league games (Villa v Wolves, Preston v Burnley, Derby v Bolton) are mixed in with rugby reports and friendly games, including one between Canada and Rangers in Glasgow. These reports come from the Sporting Intelligence section of the The Times (the sports section). This is where the name of this website comes from. Football had been played in organised fashion for several decades before the Football League began, of course. The English FA has been started 25 years earlier, and clubs had sprung up around the world, many formed by British expats. But it was the League – and copycat leagues globally – that formed the bedrock on which football became the people’s game all over the planet. Here are the details of the world’s earliest football leagues, in chronological order of formation, with notes on direct English / British influence. This list contains detail on every league of more than 100 years old, and the extended list below gives the start date of every major league in the world, including all those countries that have ever won a World Cup or European Championship, and every country currently in Fifa’s top 50 rankings. 1888 – ENGLAND: The world’s first football league begins, with the ‘Invincibles’ from Preston the first title winners in 1888-89, a season when they also completed the first Double. 1890 – NORTHERN IRELAND: The world’s second oldest national football league, beating the Scottish Football League to that honour by a week. The first winners, in 1890-91, were Linfield, who have amassed a record 51 titles in their country altogether to date. 1890 – SCOTLAND: Organised football started in Scotland in 1873 but the formation of the English Football League in 1888 led to an exodus south of players, variously known as ‘Scotch Professors’ and ‘Scottish ball artists.’ This worried the Scottish clubs; Scots played a passing game, not kick and rush, and they were integral to early successful teams in England. The secretary of Renton wrote to 13 fellow Scottish clubs in March 1890 suggesting a league. Most accepted. Dumbarton and Rangers were joint champions in the 1890-91 season. 1890 – NETHERLANDS: The Netherlands first ‘official’ league season starts, after two incomplete campaigns previously. HVV were the first champions, and in second place were Haarlemse FC (HFC) who had become the first football club in Holland in 1879 after a teenage sportsman, Willem ‘Pim’ Mulier, returned home from a trip to England with an (oval) football. HFC played a code of rugby in their early seasons but then switched to football. 1891 – ARGENTINA: The Association Argentine Football League becomes the first football league outside Europe. It was established by Alex Lamont, a Scot working at St Andrew’s Scots School in Buenos Aries. The inaugural season involved five clubs, with St Andrews winning the first title in what is now the Primera Division, where River Plate (34 times) and Boca Juniors (30) have been the most frequent champions. 1895 – BELGIUM: The inaugural Belgian season involve seven teams and was won by RFC Liege. 1897 – SWITZERLAND: The first Swiss championship was played in 1897-98 as a competition with regional games and a national final. The first champions were Grasshopper Zurich, formed in 1886 by a group of English students led by Tom E Griffith. A full league was introduced in 1899. Grasshoppers have won the title a record 27 times. 1900 – URUGUAY: The Uruguay league is formed by four clubs including the Central Uruguay Railway Cricket Club (CURCC), which had been established as a cricket and football club in 1891 by British railway workers. CURCC won the inaugural title, and later evolved into Penarol, who have won a record 46 Uruguayan titles to date. 1901 – HUNGARY: The inaugural season of the Hungarian league involved five teams, all from Budapest, and was won by Budapest TC. 1906 – PARAGUAY: The league was formed after the owner of the El Diario newspaper, Don Adolfo Riquelme, called in representatives of Paraguay’s five clubs and suggested a competition. Those gathered included William Paats, a Dutch co-founder of Olimpia, Paraguay’s first club in 1902. Olimpia remain Paraguay’s most successful club with 39 titles. 1912 – PERU: The Peruvian Football League began as a 16-team competition split into two eight-team divisions. The first winners of Peru First Division were Lima Cricket, the oldest sports club in Peru, founded by English immigrants in 1859. The initial focus on cricket switched to football. Note that organised football was played in many countries on a regional basis, not least Italy, Spain and Germany, before national leagues were formed much later. This list includes the years that national leagues began in each country. 1888: England. 1890: Northern Ireland, Scotland, Netherlands. 1891: Argentina. 1895: Belgium. 1897: Switzerland. 1900: Uruguay. 1901: Hungary. 1906: Paraguay. 1909: Romania. 1911: Austria. 1912: Peru. 1921: USA, Ireland, Tunisia, Venezuela. 1924: Sweden, Bulgaria. 1925: Czechoslovakia (then 1993: Cz Rep & Slovakia). 1927: Greece. 1929: Spain, Italy, Denmark. 1932: France. 1933: Chile. 1936: USSR. 1937: Norway, Haiti. 1938: Portugal. 1943: Mexico. 1948: Colombia. 1956: Ghana. 1957: Ecuador. 1959: Brazil, Turkey. 1960: Ivory Coast. 1962: Algeria, Zambia. 1963: Germany. 1965: Japan. 1966: Mali, Nigeria. 1977: Australia, Bolivia. 1983: South Korea. 1988: Panama. 1992: Croatia, Ukraine. 2000: Bosnia. 2001: Russia. 2006: Montenegro, Serbia. Tell me why … Manchester United needed to erect a statue to Sir Alex Ferguson now?